Home » News » Pork products hit the road again! 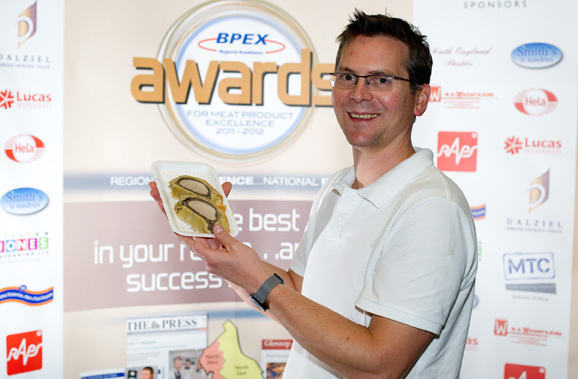 BPEX is back on tour again giving butchers, farm shops and their quality pork products a chance to shine as it prepares for the 2012-2013 Regional Roadshow and Product Excellence Events. From September 2012 to March 2013 the roadshow will visit seven regional venues to reward glorious gammons, perfect pies and superb sausages as well as a host of other quality pork and pork meat products. At each event a team of esteemed industry judges will assess products and present the much sought-after gold, silver and bronze awards, which recipients can then use to promote their products and generate publicity for their businesses. 2011 - 2012 Champion, James Archer of Archers Butchers. The product evaluation has been updated to feature ten categories, in which all entries must be produced using pork or a pork product as the major ingredient. In addition to the popular sausage, pork pie and bacon categories, butchers and producers can also enter pork burgers, black pudding and offal products and pork ready meals. Category champions will be selected from the ‘gold’ award-winning products on the night and one will be crowned Overall Champion for the region. They will then go forward to the prestigious national awards at Butchers Hall, London, on 5 June 2013. Products must be registered between 2pm and 4pm, with the awards presentation for all gold awards and the category champions starting at 7pm. The evening then closes with the announcement of Overall Regional Champion. Entry forms are posted out to butchers two weeks before each event or they can be downloaded, along with entry guidelines, from http://porkforbutchers.bpex.org.uk. Even if you’re not entering products, the events are an ideal opportunity to meet industry experts, browse a range of supplier stands and pick up new product ideas.